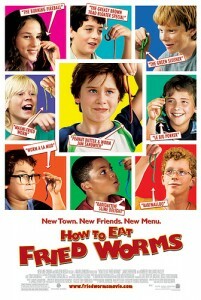 Based on the hugely popular Thomas Rockwell book, How To Eat Fried Worms brings the classic story of a boy whose bravado lands him in a difficult predicament. The film revolves around 11-year-old Billy, who inadvertently challenges the school bully on his first day at a new school. In order to save face and earn the respect of his new classmates, Billy agrees to a bet that calls for him to eat 10 worms in one day. As the pressure mounts, Billy must summon all his strength to keep his younger brother from blabbing, his weak stomach from betraying him, and his big mouth from getting him in even more trouble. How To Eat Fried Worms is written and directed by Bob Dolman (The Banger Sisters), stars Luke Benwald (Because of Winn-Dixie), Tom Cavanaugh (Ed), Kimberly Williams (Father of the Bride, According to Jim), and Hallie Kate Eisenberg (The Insider). It is co-produced with Walden Media and scheduled for an August 25, 2006 release.